From bower to npm, package management for the web has come a long way. I remember when I first started learning web development — you went online, looked for a package, download a zipped version, extract, and link on the web page. Heck, if we wanted a faster website, we would go to a CDN like jsDelivr and pick a globally cached version. From there, tools like bower emerged. Since most packages are open-source, and since GitHub is the most popular place to host version controlled open-sourced files, bower served as a management tool to download the files, easily upgrade, etc. 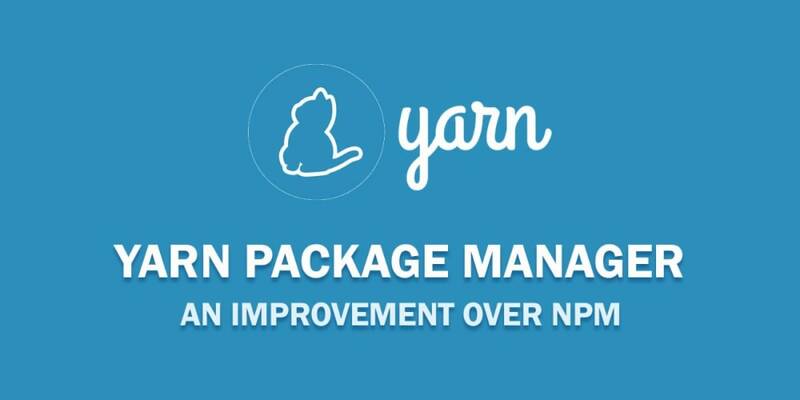 Tech giants like facebook and google decided to team up and make a better package management tool, they called it Yarn. This tool will take packages from NpmJS or Bower registries, it also runs dependency installs parallel to each other. If you&apos;ve installed a package before, yarn creates a cached copy which facilitates offline package installs. Out of the box, yarn offers flat dependency structure as compared to npm&apos;s nested structure. A single request failing won&apos;t cause an install to fail. Requests are retried upon failure. Overall, yarn offers a better workflow than npm. At the time of this writing, I am confident of two ways to install yarn on your machine. The first method would be to use npm (lol, it&apos;s like "using internet explorer to install Chrome or Firefox"). This installs yarn globally and makes it available from the terminal. The other method would be to go to the official download page and get the installer for your operating system and run it. NOTE: both methods require you to have Node.js preinstalled on your machine. Yarn doesn&apos;t intend to replace npm, more like improving on it. It uses the same package.json file, and saves dependencies to the node_modules/ folder. To test yarn, I used the same package.json file from a project I&apos;m working on. It looks like this. Then I created a test working directory called Yarn and put the package.json in there. To install the packages, from the root of the working directory, run yarn or yarn install. This will give you an interactive prompt similar to this. If you want a specific package version or tag, you can do this. For dev dependencies, peer dependencies and optional dependencies you pass the --dev --peer --optional respectively. Will save gulp under devDependencies. To upgrade or remove a package, you just replace the add command with either upgrade or remove followed by the package name. After every install, upgrade or removal, yarn updates a yarn.lock file which keeps track of the exact package version installed in node_modules directory. NOTE: you should add this file to version control if you want package version consistency. Otherwise, feel free to git ignore it if you are comfortable with patch version upgrades. We are all familiar with junk that comes with packages, from a picture of guy fieri to useless junk. Yarn can help us with that. Running yarn clean, yarn will try to remove as much junk as it can. After doing this, a .yarnclean file is created. If this file is present before you run yarn install, it will clean each package before installing it. This file you definitely want to add to version control. Having tested Yarn for a couple hours, I haven&apos;t noticed any problems yet. For the future of the project, since the project is backed by companies like Google and Facebook — it will be actively developed which can lead to yarn either becoming the defacto package manager or it being forked and used as the official npm package manager. But nonetheless, the project looks very promising and I honestly can&apos;t wait to use it again. PS: Windows users don&apos;t get yarn emojis when installing dependencies :(.